Aussie Natural water filter systems are compact and very efficient. Like the water cooler, our water filter range only take up one square foot of floor or bench top space making them very easy to fit into a kitchen or shared workspace. Installation of Aussie Natural water filter systems are quick and easy. Aussie Natural trained and qualified plumbers will have your water filter in place and ready for action with minimal disruption to your working day. Clear and clean drinking water is one of life’s essentials – we don’t believe you should have to wait to enjoy it. This Cool & Cold Water Filter System’s rental price is $40 per month + GST*. Price includes installation, filter cartridges & regular filter changes plus full warranty. Our Aussie Natural Spring Water cool and cold filtration systems are the most convenient, compact way to ensure that you’ve always got fresh water available for your friends and family. 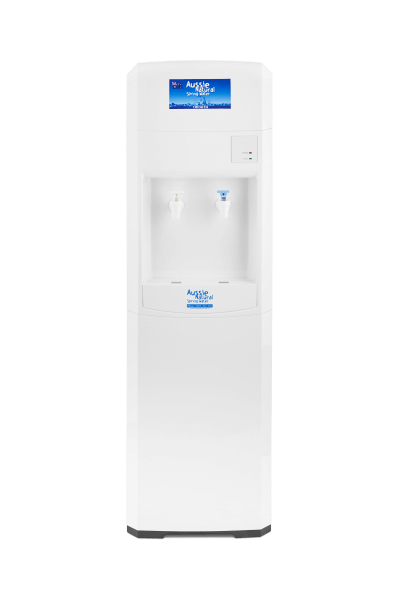 Like the water dispenser, our cool and cold water filtration systems are the perfect size for any home, office, or workplace, as they only take up one square foot of floor or bench top space. Supply fresh Aussie Natural water with ease and convenience, sourced from our natural springs in the Darling Ranges. Our Western Australian customers know that they can rely on us to deliver their Aussie Natural Spring Water products right to their door, with no long waiting or heavy lifting. Installation of the water filter systems in Perth is quick and easy. Aussie Natural trained and highly qualified plumbers will have your water filter in place and ready for action with minimal disruption to your working day. Now you can have fresh, clean water, at the temperature you want it, when you want it. Call our team today to find how you could get our Aussie Natural Spring Water products delivered straight to your door! At Aussie Natural Spring Water, we’re proudly Perth’s premier spring water supplier, providing quality spring water at competitive prices- whether it’s bottled water, water coolers, water filters, or anything in between, Aussie Natural Spring Water can provide clean, refreshing water to meet a range of needs and requirements, at competitive value that doesn’t cut down on quality. Website designed and built with by Dilate.